“Twin” Falls likely derived its inexact name from the only two of its several descents visible from distant vantages such as this one on the western approach to the falls. Additional falls farther upstream are obscured from sight until revealed by bends in the trail. Twin Falls Trail (Western Route), August 07, 2016. The Twin Falls are accessed from either of two trailheads and lie near the midpoint of the trail that connects them. The western trail tracks the South Fork Snoqualmie River from below the falls, while the eastern route from the Homestead Valley trailhead begins on the mixed-use Iron Horse Trail before branching into forest and approaching the falls from above. Those wishing to add some distance to the relatively short jaunt to the falls may choose to hike both sections of the trail from end to end, walk further along the Iron Horse Trail in either direction (the Iron Horse Trail stretches over 100 miles/160 km from Cedar Falls to the Columbia River), or tack on a more robust hike up the trail to the summit of nearby Mount Washington, which departs the Iron Horse Trail a short distance from the Homestead Valley trailhead. From the western trailhead, the path meanders along the South Fork Snoqualmie River’s boulder-strewn course below the falls. The lush woodland about the western trail alternates between coniferous and deciduous forest and still includes a few old-growth giants. Shielded from the noise of nearby Interstate 90 until just before it reaches the falls, the western trail offers a bit of riverine tranquility. The western trail tracks the South Fork Snoqualmie River, which flows lazily at this point in comparison to its frothy plunges just upstream. Twin Falls Trail (Western Route), August 07, 2016. Verdant deciduous woodland drapes much of the western trail’s riverside route. Twin Falls Trail (Western Route), August 07, 2016. As both the western and eastern trails climb to their junction near the falls, they enter fern-floored, mostly coniferous forest. Twin Falls Trail (Western Route), August 07, 2016. The falls’ eastern access from the Homestead Valley trailhead offers a diversion for those enjoying the Iron Horse Trail, the former route of the old Chicago, Milwaukee, St. Paul and Pacific Railroad between Chicago, Illinois and Tacoma, Washington and now a wide gravel path popular with local walkers, runners, and cyclists. Throughout the spring and summer, wildflowers line the Iron Horse Trail before the falls’ eastern trail ducks into dense woodland. The Homestead Valley route also provides a bit of anticipation, as it approaches the falls from above, leaving the grandest view of the falls’ final descent for last. Given the eastern trail’s proximity to Interstate 90, the whir of traffic is ever present until drowned in the rush of cascading waters at the trail’s end. Signage for the Homestead Valley route is sparse. 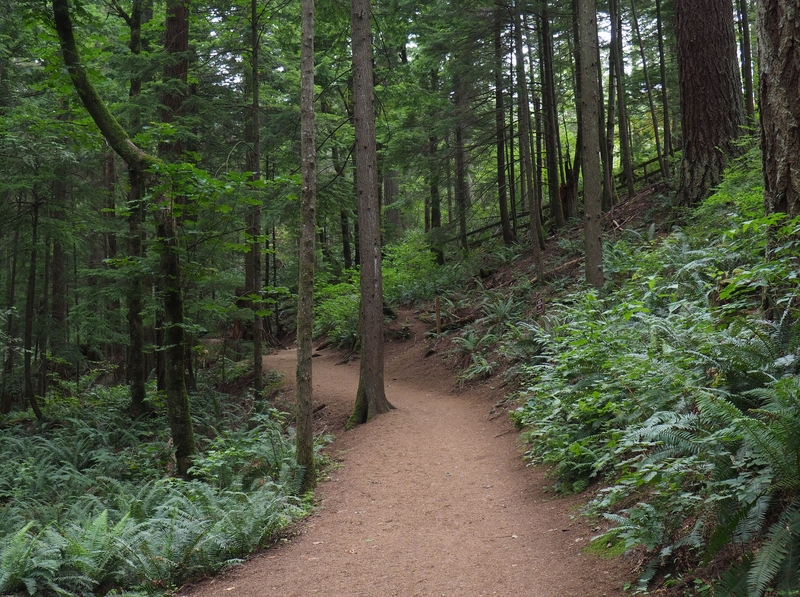 From the parking area, a spur trail and then a gravel spur road lead a short distance to the Iron Horse Trail — turn right onto both the spur road and the Iron Horse Trail. The eastern trailhead to Twin Falls is on the right approximately 0.30 miles/0.50 km down the Iron Horse Trail and is marked by a small sign. In spring and summer, the spur trail and road leading to the eastern trail are mantled in luxuriant foliage. In the somber months of winter, enjoy the sharp contrast of red alders’ (Alnus rubra) speckled white bark against the surrounding forest gloom. 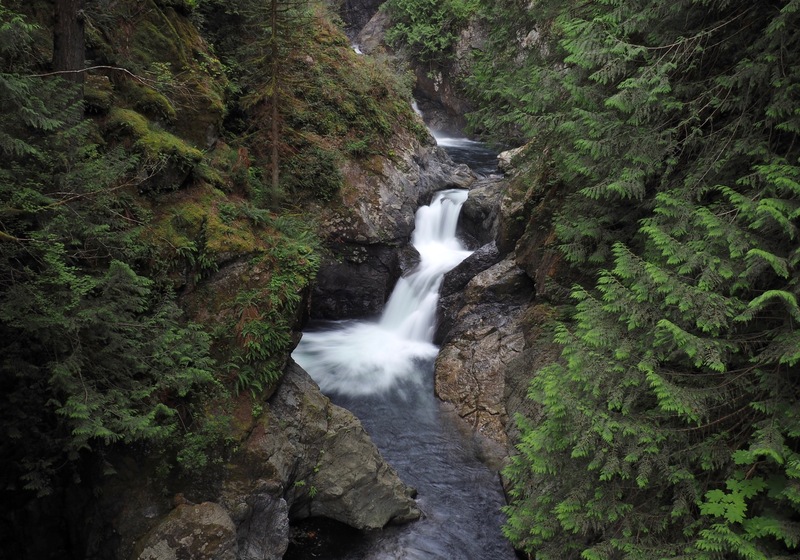 Twin Falls Trail (Homestead Valley Route), May 25 and March 08, 2015. 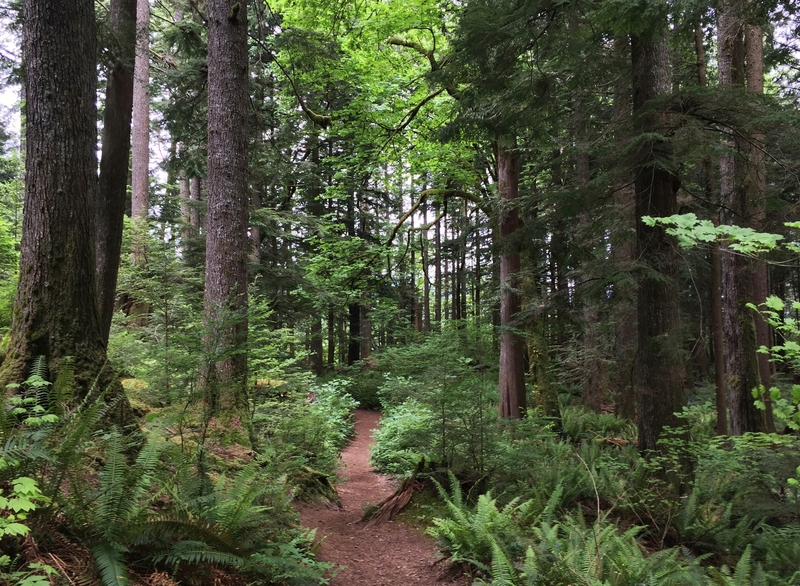 The nondescript spur road and Iron Horse Trail, strung with power lines above, are nevertheless lined with lush foliage and wildflowers in the spring and summer months. Twin Falls Trail (Homestead Valley Route), May 25, 2015. 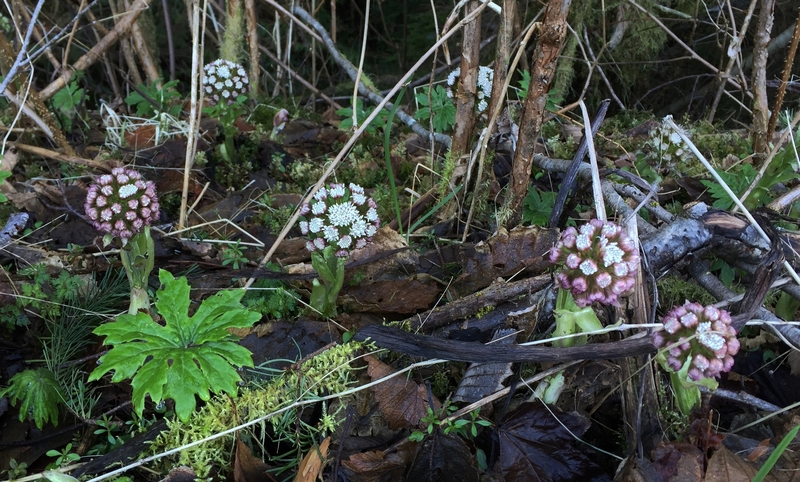 In early spring, arctic sweet coltsfoot (Petasites frigidus) pops up along the trail with ready-made bouquets. Iron Horse Trail, March 08, 2015. Spring and summer wildflowers line the Iron Horse Trail, including, clockwise from top left, constellations of stinky Bob (Geranium robertianum, derisively named for its unpleasant odor when crushed) and Siberian miner’s lettuce (Claytonia sibirica), oxeye daisies (Leucanthemum vulgare), foxgloves (Digitalis purpurea), and thimbleberries (Rubus parviflorus). Iron Horse Trail, May 25, 2015 and July 30, 2016. In the sparing depths of winter, the trailside forest is reduced to its stark essentials (left), in contrast to spring’s largesse merely months later, when the same seemingly desolate forest is transformed into a burgeoning greenwood (right). Twin Falls Trail (Homestead Valley Route), March 08 and May 25, 2015. In the summer months, thickets of vine maple (Acer circinatum), the only non-Asian species of maple classified as a “Japanese” maple, ensconce the trail in verdure. Twin Falls Trail (Homestead Valley Route), May 25, 2015. Pacific bleeding hearts (Dicentra formosa) abound along the eastern trail in their standard, delicately blushing color form and their less common pearly, or, “alba” form. Twin Falls Trail (Homestead Valley Route), May 25, 2015. Nearer the falls, the eastern trail enters predominantly coniferous forest, still accented with maples’ arching boughs. Twin Falls Trail (Homestead Valley Route), May 25, 2015. The South Fork Snoqualmie River appears from nowhere as it descends a right-angled falls visible from a footbridge spanning its rocky gorge. Twin Falls Trail (Homestead Valley Route), August 07, 2016. 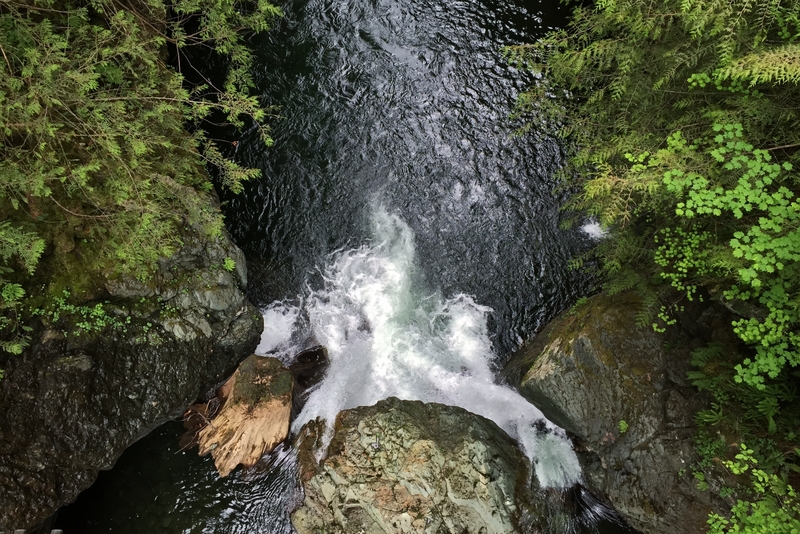 Peer downward from the footbridge — if you can — for a bird’s-eye view of yet another small falls. 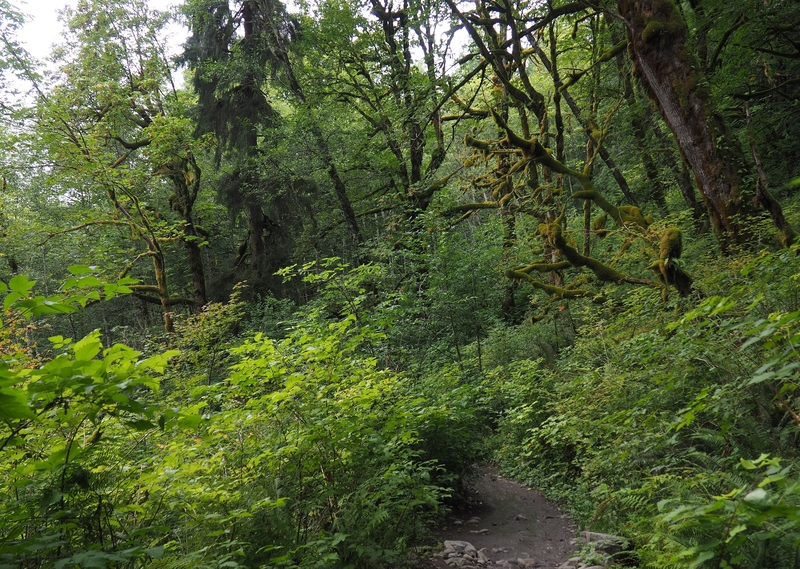 Twin Falls Trail (Homestead Valley Route), May 25, 2015. From the footbridge, the view sweeps down the gorge and across the riverbed below, offering little hint of the spectacle yet to come. A short distance beyond, at the western and eastern trails’ junction approximately halfway between the two trailheads, an unmarked side trail descends to the final and largest of the falls. Stairs and railings aid hikers in safely negotiating the terrain about the falls, although some are quite steep and sometimes eroded from heavy use. 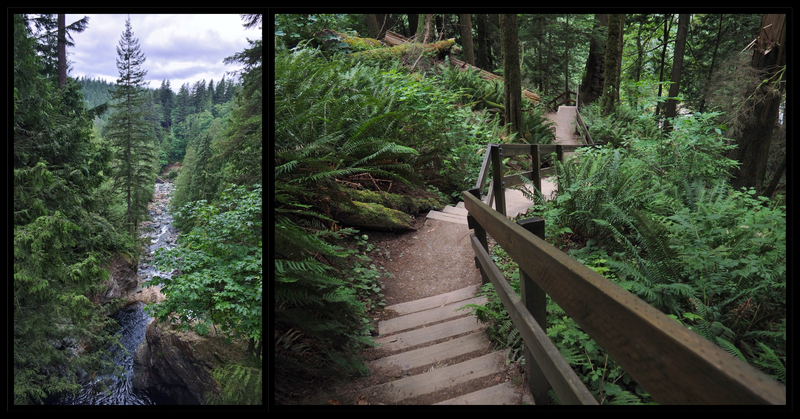 Twin Falls Trail, May 25, 2015 and August 07, 2016. Within only steps of the lookout platform at the side trail’s end does the river’s final and dramatic plunge come into view. The river descends, by varying estimates, 135 to 150 feet/41 to 46 meters over the last falls, displaying classic “horsetail” form as it splays in individual rivulets across the cliff’s vaulted face. The falls empty into a narrow and deeply eroded amphitheater-style basin directly beneath the viewing platform. Twin Falls Trail, August 07, 2016.